Followed by the grand success of Get It Beauty On the Road in Singapore, tvN Asia continues the hype by bringing the shooting to Asian country, and guess what? Malaysia is in the list! tvN Asia's brand-new original production in 2018, Get It Beauty On the Road - Malaysia segment features former Miss A member, Min, Korean beauty mentor Kim Jung-Min and our local celebrity, Kaka Azraff. Thanks to Fast Tracks Events, GOkpop was given an opportunity to visit the studio and sit down with the hosts to talk about their future plans and share some of beauty/fitness tips. 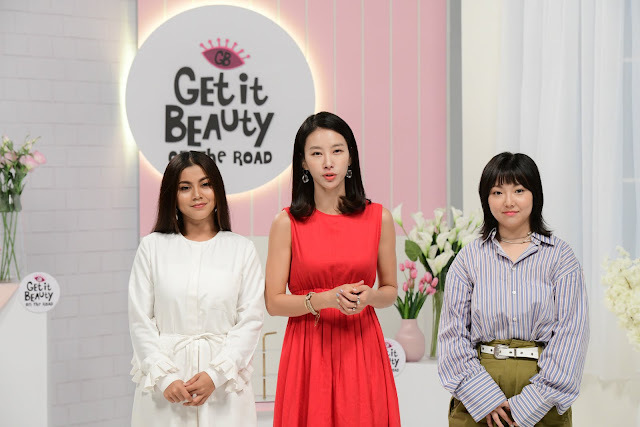 Get It Beauty On the Road Malaysia segment follows the main concept of the Korean show by exploring K-beauty products and inviting Korean Beauty/Fitness influencers to identify beauty, skincare and wellness problem faced by the locals. 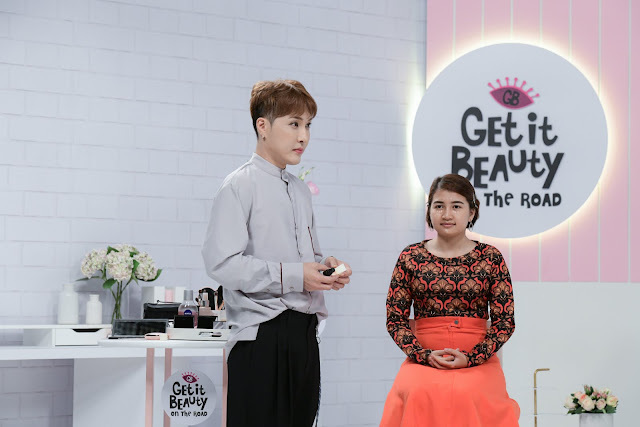 Last week, the hosts have been travelling around Kuala Lumpur for shooting and the famous Korean make-up artist, Kim Ki-Soo also joined the team in sharing the latest beauty trends and helped the team in tackling the common issues faced by each individual. Q: What you have been done lately? Any future plans for your solo activities? Min: I have been working on music, collaborating with other artists and musicians and have featured in a single, “Marathon” by Deepshower. Q: Do you have any beauty item that you would like to bring any time? Q: How do you feel being able to partner alongside with Min and Kim Jung Min for Get It Beauty On the Road? Kaka Azraff: This is like a big opportunity for me. I feel honored to be part of the team. Q: Which Korean makeup do you like the most? Kaka Azraff: The simple and natural makeup. I like how they use the products to enhance beauty rather than cover it up. Q: What’s your daily must use item when you stay indoor or outdoor? Kaka Azraff: Sunscreen and moisturizer is a must to apply especially for the hot weather here in Malaysia. The hot weather will cause aging and we need to stay hydrate every time, so these 2 items is a must to apply. Q: How do you maintain a fresh-look in such a hot weather? Min: I apply a very light foundation to maintain a fresh-looking make up. Try to keep it light. Q: Have you tried any Malaysian food? Min: I went to China Town, Jalan Alor and my Malaysian friends brought me out for some good Malaysia food. Kim Jung-Min first back-packing trip was in Penang! Q: What’s the difference shooting in Malaysia and Korea? KJM: In Malaysia, we have indoor and outdoor shooting. I feel like I am able to share more realistic beauty tips to the audiences. / Malaysia is the first country that I went for back-packing trip. It’s a meaningful country to me. So, what I want to say from here is that I feel very thankful that K-beauty has received so much love. Q: The team has been touring around KL for shooting, so what aspects of Malaysia do you find charming? KJM: I have skin trouble whenever I go for travel, but this time I am not sure whether it’s the food, weather or water here (in Malaysia), I doesn’t have the skin trouble. Recently, I am interested in Halal beauty products and have started to use it during the shooting, I feel like my skin has become healthier throughout the shooting. I am really surprise and think this might be the aspects that I find it charming. Q: Do you have any plans to return to acting? KJM: I have been emcee for many years. No matter is drama or variety show, I would like to take on new challenge, so, if there’s an opportunity, I would definitely give it a try. I would be great if my fans or audiences in Malaysia able to see that. Q: How do you stay healthy while having a busy schedule? Get It Beauty On The Road answers every girl’s pressing questions on beauty, by providing the latest information that they didn’t even know they need! In addition to makeup how-to’s, audience will get practical beauty tips directly from the hosts and K-beauty expert the Korean way! There are no ugly ladies but only lazy ones! Get perfect transformations from Get It Beauty On The Road beauty tricks!